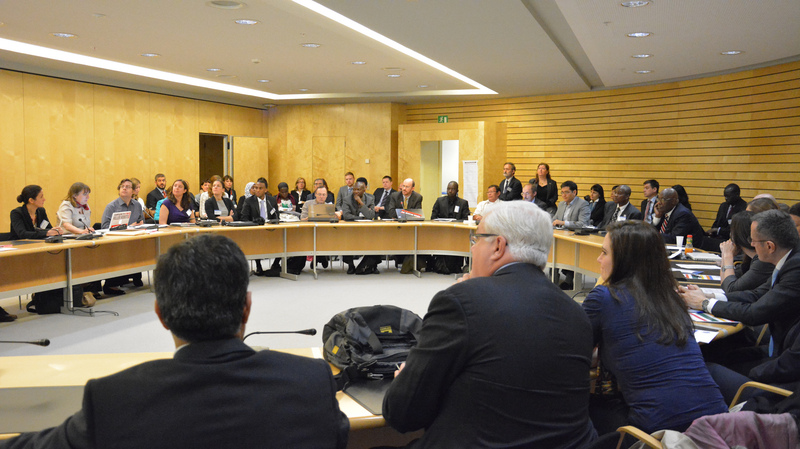 Mine Ban Treaty Intersessional Standing Committee Meetings were held last week in Geneva. I was one of the two lucky YP’s to get to take part in those meetings as an apprentice member of the International Campaign to Ban Landmines-Cluster Munition Coalition (ICBL-CMC). Aside from making the endless journey to Zambia more bearable, this stopover in Geneva has been an incredible opportunity to experience firsthand what has made this campaign so remarkable and significant in changing the nature humanitarian diplomacy and state-civil society interaction in multilateral forums. My colleague Mohammed in this space quite rightly described the aims of intersessionals so I won’t go into the details, but I will share a few highlights of the meetings and some observations. As Mohammed pointed out, the meetings were marked by reported allegations of use of landmines by a State Party to the treaty, Yemen, in 2011. A big part of the lobbying work by ICBL-CMC campaigners was to encourage States Parties to speak up and request a proper investigation and appropriate response by the Yemeni government. Should the allegations prove correct – they are supported by compelling evidence – it would be the first time a State Party to the Mine Ban Treaty is found to have committed the most serious violation of the treaty obligations, i.e. use landmines. Thanks to the efforts of dedicated and incredibly efficient campaigners, 15 states did express their concern – which far exceeded the Campaign’s most optimistic expectations. A lack of reaction by other States Parties would have had serious implications for the strength of the treaty. As noted by Steve Goose, arms division director at Human Rights Watch, states need to take ownership of the treaty. In this case it appears they did. The sad news is that Yemen is not the only State Party suspected of having used landmines in the past couple of years – Turkey, Sudan/South Sudan (use in 2011-2012 is confirmed, but unclear whether by government forces or rebels groups) and Cambodia are also on the list of countries to follow closely. With respect to Treaty implementation, campaigners were also gravely concerned with missed deadlines for stockpile reductions by Greece, Belarus, and Ukraine – which are effectively in violation of Art. 4 of the treaty. That means approximately 9 million AP mines should have been destroyed over the last 5 years and instead remain in stock. Reasons given by those governments included administrative obstacles, technical difficulties and other hardly comprehensible excuses. In addition, South Sudan and Guinea Bissau have recently declared newly discovered stockpiles, but have not reported any progress towards destruction. The ICBL urged those two states to quickly ensure the safe destruction of these stocks as they pose even greater risks of diversion than otherwise government documented stocks. Another concern of campaigners was the all-time low for transparency reporting – treaty obligation under Art. 7. As of May 2013, only 38% of States Parties had submitted their annual updates including State Parties with mine clearance obligations, ones with significant numbers of survivors, and ones that retain mines. Needless to say this poses a great challenge to the Mine Ban community in ensuring follow up on the implementation of the Treaty. One thing I was reminded of during meetings is that landmines are far from being a “southern” issue. I was in fact surprised to learn, for instance, that Germany – a major donor country and long-time supporter of the Treaty – had submitted an extension request for the completion of its demining obligation (the German government announced a suspected hazardous area in former Eastern Germany back in 2011). If a country like Germany is unable to fulfill its clearance obligations “as soon as possible”, as required by virtue of the Treaty, the signal sent to less developed countries is far from encouraging – something that was also highlighted by the ICBL. Now on the bright side, two countries took the opportunity of intersessionals to declare themselves mine-free: Bhutan and Venezuela! So there is hope after all! I started this post by noting that I got to experience what had made the ICBL such a remarkable and defining campaign. On my very first day at the intersessionals I was asked to take part in a lobbying meeting – along with two experienced campaigners – and interrogate a representative on some of his country’s specific measures to implement the Treaty. Aside from discovering what lobbying actually consisted of (and that I enjoyed it! ), I realized that the cliché of civil society/state relations as inevitably negative and confrontational is quite fallacious. Lobbying meetings, for the most part, were very cordial and relatively candid. Most states representatives – including that of Yemen – showed their good will and commitment to treaty obligations. Whether commitments are translated to action is another story, but at least states are hearing and are reminded (and sometimes informed…) of their responsibilities. The Campaign is filling a major diplomatic gap by saying what States Parties sometimes can’t afford to say out loud. Seeing the ICBL (and other NGOs) sitting in the plenary room along with diplomats, making strong statements directly addressing States Parties, I couldn’t be more convinced of the importance of the model set by the ICBL.